The essential parts of the ear are three in number: the external, the middle and the internal ear. The external ear comprises the fleshy part of the organ situated outside of the skull and a channel hollowed out of the bone and running into the head, called the auditory meatus. The fleshy part of the ear seems to have no especial value in man except as a means of displaying ornaments. It represents in rudimentary form the somewhat elaborate and movable structures which are so useful to many of the lower ani­ mals. 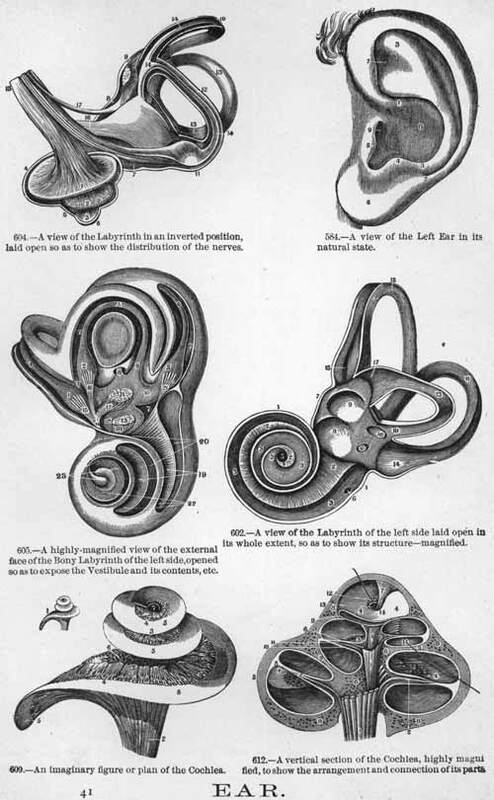 The human ear is also provided with muscles, which, how­ ever, are mere reminiscences of the muscles which were probably useful to man before he attained his present state of development; at any rate they are of no service in the human animal, though we meet, now and then, with a man who possesses a slight ability to move the ears. The auditory meatus, the bony channel which leads from the exterior to the middle ear, is of considerable importance to the surgeon, since it becomes the seat of many difficulties which may impair the patient's comfort and health quite materially. -Foreign Bodies in the Ear: treatment. -Wax in the Ear: symptoms, treatment. -Inflammation of the Drum of the Ear: symptoms, treatment. -Injuries to the Drum of the Ear. -Polyp of the Ear: symptoms, treatment. -Granulations in the Ear: treatment. -Eczema of the Ear: treatment. Above is a picture of the human ear and it's parts.